Successfully Added Bluetooth Sports Tracking Watch - Blood Pressure, Blood Oxygen, Sleep Monitoring, Pedometer, Notifications (Red) to your Shopping Cart. Lightweight and stylish smartwatch for him or her. Keep accurate track of your daily activity levels with this Bluetooth fitness tracker and smartwatch. With its pedometer, this fitness gadget keeps you constantly updated about the number of steps you took and distance you have covered throughout the day. This feature makes it easy for you to reach your daily activity levels and to work towards a healthier future. Along with its pedometer also comes a calorie counter that lets you know how much energy you have burned during previous exercise sessions. 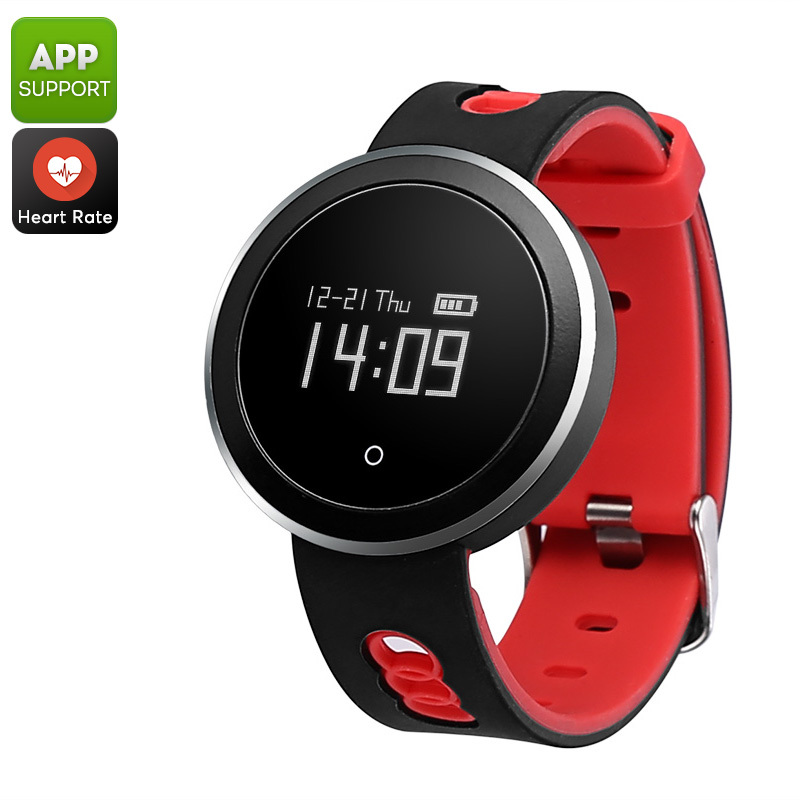 With a heart rate monitor in place, this fitness gadget even treats you to accurate heart readings at any given moment. Based on this information, you’ll be able to adjust the intensity of your workouts in order for you to workout in the most efficient manner. This Bluetooth watch features a 0.95-Inch touch display which makes it easy to browse through all its features. With its soft TPU strap, this fitness tracker watch is comfortable to wear. The watch furthermore supports a gesture wake feature that makes it wake up automatically when you raise your hand. This makes it easy for you to check on the time or to use the watch’s other features. A 110mAh battery ensures you’ll be able to enjoy all this sports watch has to offer for up to 7 days on a single charge. With its Bluetooth 4.0 connectivity, this smart bracelet can be easily paired with your iOS or Android phone. When done so, it allows you to easily analyze your activity levels through the dedicated mobile application, Jyou. Additionally, it lets you see incoming calls and message reminders on your wrist to make sure you’ll never miss out on an important update again. Whether you simply use it to check the time or for working towards a healthier future – this stylish sports watch and fitness tracker is sure to meet your demands.